Making croissants is definitely not for the faint of heart. But, whilst there is an incredible amount of technique involved, following some simple (and repetitive) processes, will ensure that your end product is delicious. If you can stick with me, I’ll show you how to make classic French croissants like an expert. I learned all of this through a cooking class I went to in Paris. Possibly the biggest tip I could give anyone attempting to make croissants, is not to rush any aspect of this process. It can be stopped and started along the way, but each step should be done properly. Taking shortcuts will make your path to beautiful, flaky croissants all the more difficult. Also, the other big tip is that heat, high temperatures and humidity are never going to be best friends with croissants. If you live in a hot environment, it could get tricky. I wait for winter where I live or else it’s just too hot. If you have air conditioning, you can make them at any time of year. First we need to make a template. Fold piece of A4 paper in half (into C5 size). Put in the centre of a large piece of baking paper. Fold baking paper in towards C5 paper in the centre. From left to right, then right to left, then top to bottom, then bottom to top. It should now envelope the C5 piece of paper. Crease the baking paper along the edges. Open up and remove the C5 paper and put the baking paper aside for later use. Tip: Butter must be high fat. At least 82% fat. The harder the block of butter the more fat it contains. Use unsalted butter. If you have a 250g block of butter, cut it across on the diagonal. You need to be precise here so that you have 125g. Then cut the 125g block into half width ways. Put the two halves together to make a rectangle. You don’t need to be as precise here. Open up the baking paper that you put aside and put the butter in the middle. Fold the baking paper back into the format that you made earlier. i.e. around the C5 piece of paper. Turn over so that the folded sides are on the back. Flatten the butter slightly with the rolling pin. Next step is to push the butter into the four corners first. Be very careful not to pierce the edges of the paper. Roll and push gently into the corners. Turn the paper around so that you are pushing ahead of you instead of behind. Flatten to the same thickness. Apply less pressure to do the sides. Put into the fridge until cold and hard. 1 tbsp / 25g melted butter. Melt the butter, add it to a cup with the water in it and let it set. Tip – it is easier to use the melted butter if it is slightly set and it is also easier to measure accurately if it is melted. In a bowl, mix the dry ingredients well together. It is very important that the yeast does not touch the salt. Tip dry ingredients onto the bench. Use the bottom of the bowl to make a well. Mix liquids together slightly and then pour into well. Break the wall slightly, a bit at a time and mix in with fingers of one hand only. The mixture should incorporate all the wet ingredients and should look like a thick pancake mix. It should come to the ‘pancake’ stage without using all the flour. Don’t worry, this will be used soon. When it takes on the thick pancake consistency, quickly mix the remaining flour into the wet mix. Work quickly but without over mixing to stop the spread of the liquid. Cut it with the scraper to bring it all together. The kneading process is next, and it will require about 10 minutes of constant activity. This is where you build your muscles. Push the dough away from you and bring back. Turn with three fingers holding the bottom of the dough and the palm of your other hand, stretch away from you. Roll back. Turn clockwise. Repeat. Take edges and fold into middle from six points. Turn over and roll into a curved ball again. Put dough in fridge for at least 30 minutes. Place a little flour on the bench. Take dough from the fridge and put on the bench. Draw a rectangle in the flour to visualise where the pastry is going to be rolled to. Bang down on dough with rolling pin and flatten a little. Fold an A4 piece of paper in half again. This is used to help measure how long and wide to roll the dough. For the width it should be the width of the A4 plus thumbs either side. Length is 1x the A4 length plus a little more than 1/2 of the A4 paper again. Roll using the rolling pin. 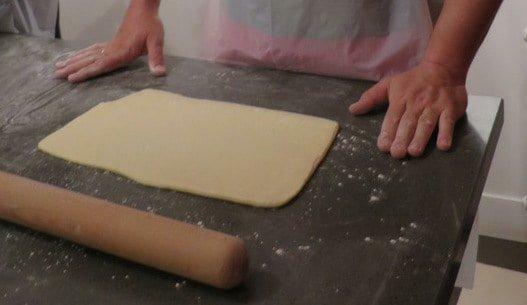 To keep dough as straight as possible, keep your hands on the middle of the rolling pin, not the ends. Take the butter out of fridge and unwrap the top of the baking paper, leaving the butter still attached. Place on the lower part of your dough. 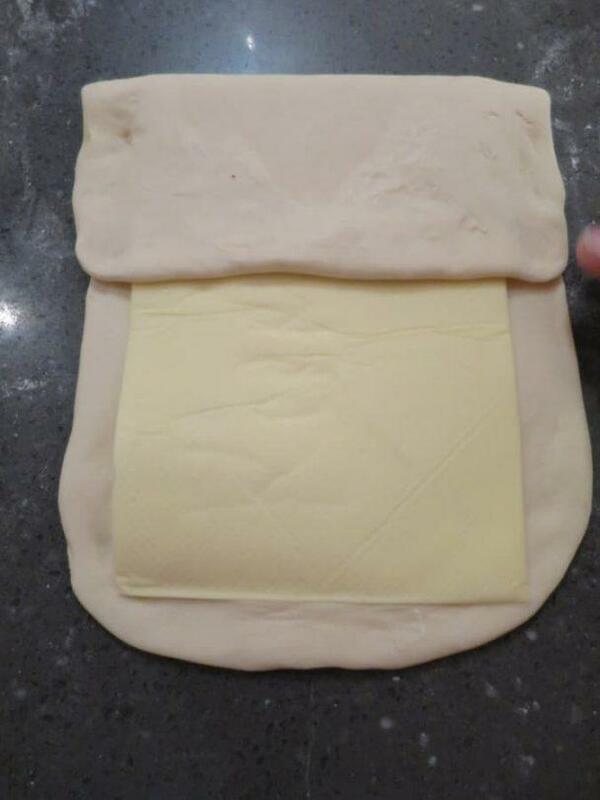 Unwrap the butter, turn over and remove the baking paper, leaving the butter on the dough. We are ultimately going to do four folds. A simple fold, a double fold and then another simple fold. Bring the top of the dough down to halfway down. This will bend over the top of the butter. Next fold the bottom of the dough up to the top. This will also take the butter with it. Gently press the open ends with the rolling pin. Put some more flour on the bench and move the dough around on it. Place the bookend (rounded side) on the left hand side. (ie turn 90 degrees). Add some flour. Using the rolling pin, tap gently all over the dough. This helps distribute the butter through the dough. Roll up and down on the dough from the middle. Always roll from the middle up and then the middle down. For this fold, you need to fold each end up towards the middle so they are kissing/touching. They are not to be folded over one another like the simple fold done previously. Pinch in the middle to seal. Fold over so that it is like a book. Turn the dough around so that the book end is on the left hand side. Put in fridge/freezer depending on how quickly you want to make these. You need at least one hour in the fridge between this fold and the last fold. Be more delicate with the last fold. Place bookend on the left hand side. Move around in the flour. Press ends together gently with rolling pin. Tap all over once again with the rolling pin. Wrap it in plastic wrap once again and leave for an hour in fridge. Roll it to be as long as your rolling pin less the width of the dough scraper. Before moving, check it is not sticking to the bench. Add flour if necessary. Put some more flour on top. Check length. If you have lost length, roll from the middle to left and middle to right. Width should be 2x dough scraper. 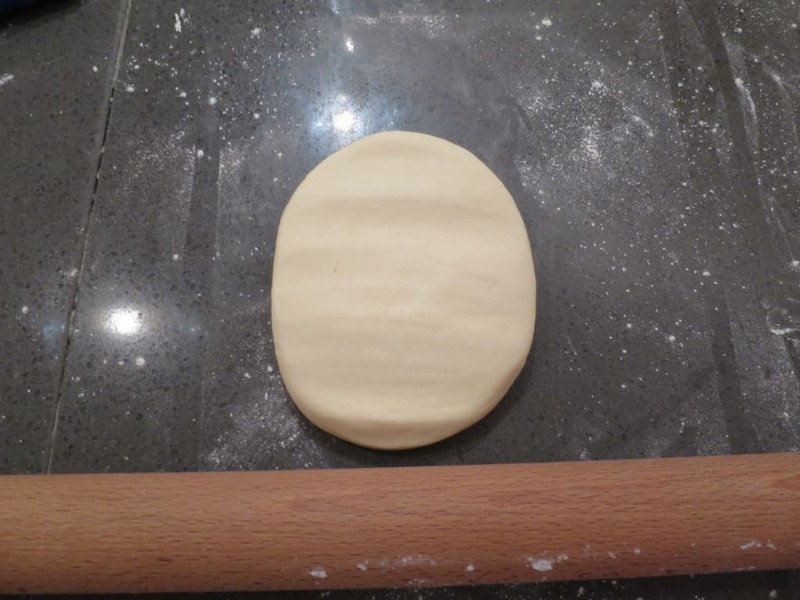 TIP – to keep dough rolling straight place hands in the middle of the rolling pin. If you have an odd shaped end, just roll out diagonally at the corners. TIP – It is very important to cut/slide with a sharp knife to straighten the edges. Do not drag the knife through the dough. From the half blade mark, cut the dough to the bottom RH corner and scrap dough. This can be used to make other pastries later. On the bottom side of the dough, make a full knife blade mark (to the left). Cut first croissant shape from this mark to the first half knife blade mark. And then from the top face continue cutting croissant shapes with full knife blade widths. Once you have your triangles, take individual piece and stretch gently to make a little longer. Then, fold the two bottom corners up a little as per the photo below. Gently roll up the croissant. Limit touching as much as possible. 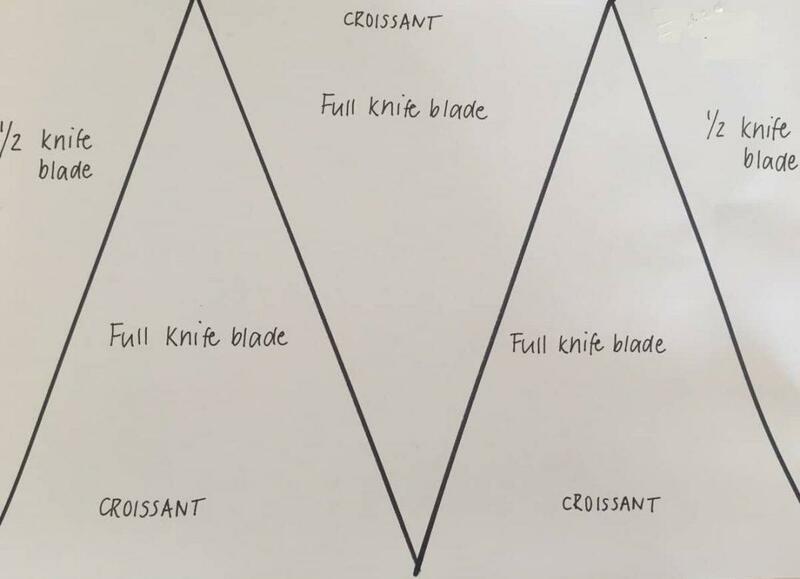 Ensure the final end of the triangle is placed underneath the croissant on the tray or else it will unfold when cooking. Brush with egg wash (plain egg) and leave to prove for 2-3 hours at a temperature no higher than 25 degrees celsius. Preheat oven to 200 degrees celsius and bake croissants for 15-20 minutes or until golden. TIP – create steam in oven by spraying water around the entire oven area or add water to a hot tray on bottom of oven. Prepare sugar syrup by mixing 100g boiling water and 50g sugar. Stir until sugar is dissolved. Using a small brush, glaze the croissants with the sugar syrup as soon as they come out of the oven. Use the syrup sparingly as you don’t want to make them soggy. There is no denying that making croissants is a time consuming process. To make all the effort worthwhile, you need to take you time. Luckily, there is a way you can do a few steps every day, making it far demanding of your time. Day 1 – Beat butter, make Détrempe. Put in fridge. Day 2- Put butter and dough together. This equals one simple fold. Put in fridge. Day 3 – Do a double fold. Put in fridge. Day 4- Do last simple fold. Put in fridge. Day 5- Shape the dough. Day 6 – Have a break ! Day 7- Proof the dough, egg wash, bake and apply sugar syrup. So there you have it. Take the time to follow all of these instructions and steps, taking note of how the it should look in the photos and you will produce some amazing classic French croissants. Have you made classic French croissants before? I’d love you to share some photos with me. Be sure to come back and let me know how you went if you decide to jump in the deep end and give these a go. Inspired by these beautiful classic French croissants? Pin this to your Pinterest Travel, Food or Cooking boards for later reference. This looks like a huge amount of work. I think I might just find a good patisserie instead – lol. There’s definitely a lot of work Lyn and it takes precision but the end result is amazing and it’s so great to be able to say I achieved it myself ! These look delicious! I love croissants and there isn’t anywhere to buy them where I am now. I would definitely like to try this. If you keep making them, I’ll keep eating them! Let me know how you go Krista! Oh dear, this is a lot of hardwork. The step by step pictures are lovely and the croissantz look to die dor. Have attempted puff pastry before and it was way too delicious than the store bought ones. I am sure croissants rastes good too.. Awesome work! Thanks Sahar. It definitely does take some patience but it is worth it! There’s no comparison to bought ones. This is too labour-intensive for me but clearly the croissants are worth it! Yeah I get that. I love a challenge and it is soooo worth it. Wow! No wonder I love croissants. Didn’t realise there is a block of butter in there. I’ve always just bought canned, lol. This seems like quite a bit of work but I’m sure it’s well worth the effort. They look delicious! What do you mean canned? I’ve never seen a canned croissant? Great Tandy. Let me know if you do get a chance. Would love to see them. Wow! This reminds me why I don’t bake! It is such an exact form of cooking! But when you get it right the results are amazing. Having said that I would definitely taking the class thought It would be fantastic! For some reason it seems to be easier in the class…..you don’t need to remember every step. Oh wow Anna, that sounds both horrible and predictable that a chef would do that to trainees. It’s hard enough as it is without that being forced on you. Living in Queensland, the heat can make it difficult so I understand completely the issues with the heat as well. Hopefully you might give it a go one day….Good luck if you do. These croissants look amazing! Although they look like a lot of work, I’m sure that they taste even better at the end- knowing that you made them yourself!!! Hi Sine, that’s a terrific question and such a great idea. They do require such hard work that making a bigger amount would be just perfect. Whilst I haven’t personally done this myself, I can’t see why this would be a problem. After all, that’s how all the ones in the commercial supermarkets etc operate. Would be happy to hear back from you if you give it a good and see how it all went. I took this same class in Paris and, well, you took much better pictures and notes! So thank you for posting. Making a batch this weekend. I knew I had to be “on it” as I’d never be able to make them again if I didn’t. Good luck !